The Medieval saw the emergence of great changes in English society including the music played during the Medieval times and era. The violent times of the Dark Ages had led to a primitive society lacking in elegance or refinement. Medieval music consisted of the religious or secular music of the church, however some pagan rituals relating to music and dancing, such as Maypole dancing, continued throughout Medieval times. The times also saw society changing due to the influence from various foreign cultures. Travel, prompted by the Crusades, led to a new and unprecedented interest in beautiful objects, elegant manners, poetry and music. Medieval Music in Europe was influenced by Arab love songs. The ideals of courtly love were introduced and embellished by the Troubadours, Trouveres and Minstrels further influencing the content and styles of Medieval music. In the 11th and 12 centuries Troubadours, Trouveres and Minstrels were the poets and musicians who influenced Medieval Music. The troubadours and minstrels sang songs of courtly love and romance. The Normans had conquered the English during the Battle of Hastings of 1066 and brought their culture and music to the English realm. The songs of French troubadours were heard in English courts as a result of England's political affiliations and royal marriages. Since the Norman Conquest the language of the English court was French so the songs and music of the French troubadours, trouveres and minstrels were easily assimilated into English society. The aristocratic troubadours were poets who originated in the south of France where they wrote the lyrics in Provencal (langue d'oc). The elite troubadours of the north of France wrote in French (langue d'oil) and were called called trouveres. 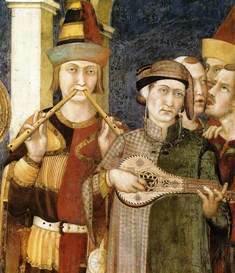 Medieval poetry of the troubadours was invariably linked with music. The tales of King Arthur and the Knights of the Round Table, originating with music and the poems of the English and Welsh Bards, were themes which were included in the lyrics of the Troubadour and minstrels songs. Noble ladies of the Medieval period were famous for their patronage of Medieval Music. Eleanor of Aquitaine married King Henry II of England in 1152 and brought her love of music and the European troubadours to the English court transferring the tradition to England. Early Medieval Music was first performed in unison. The notes were usually the same length and song, or played, in the Key of C. Harmony was gradually introduced and by the 12th century a method of music notation developed which indicated the length of each note and the pitch. There was a great variety of musical instruments employed in the production of Medieval Music. Although much of the music was secular there was also a huge growth in entertainment for both the rich and the poor. Castles and courts employed their own musicians and then the towns started employ their own musicians, creating town bands who had evolved from the Waits.